Wayang is a theatrical performance employing puppets or human dancer. The puppet could be made of leather or wood. Wayang is an Indonesian word for theatre (literally "shadow"). When the term is used to refer to kinds of puppet theatre, sometimes the puppet itself is referred to as wayang. Performances of shadow puppet theatre are accompanied by gamelan in Java, and by "gender wayang" in Bali. 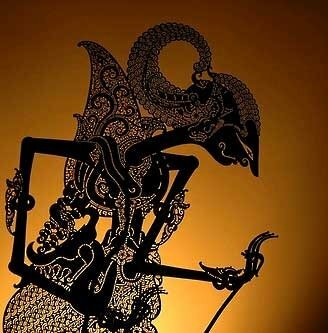 UNESCO designated Wayang Kulit, a shadow puppet theatre and the best known of the Indonesian wayang, as a Masterpiece of Oral and Intangible Heritage of Humanity on 7 November 2003. In return of the acknowledgment, UNESCO demanded Indonesia to preserve their heritage. Wayang Kulit plays are invariably based on romantic tales, especially adaptations of the classic Indian epics, "The Mahabarata" and "The Ramayana". Some of the plays are also based on local happenings (current issues) or other local secular stories. It is up to the conductor or "Tok Dalang" to decide his direction. The figures are painted, flat woodcarvings (a maximum of 5 to 15 mm thick -- barely half an inch) with movable arms. The head is solidly attached to the body. Wayang klitik can be used to perform puppet plays either during the day or at night. This type of wayang is relatively rare. Wayang Museum is a museum which keeps collections of wayang from various territories in Indonesia and even from other countries. Wayang Museum Building was constructed at a former old church location, which built by VOC in 1640 with the name “de oude Hollandsche Kerk”. The church functioned as a house of worship for Dutch civil and military in Indonesia until 1732. In 1733 the church was renovated and the name was changed to be “de nieuwe Hollandsche Kerk”. The building existed until 1808, until an earthquake nearly destroyed it. On the location where the church previously stood, a building was constructed. The collections of Wayang Museum are very various, in both small and big size. Wayang Museum collects Indonesian leather wayangs, like Kedu, Tejokusuman, Ngabean, Surakarta, Banyumas, Cirebon, Gedog, Sadat, Madia Krucil, Sasak, Kaper, Wahyu, Kijang Kencana, Ukur, Suluh, Klitik, and Beber. Wayang Museum has collections of scarce wayang as well like Intan wayang, Suket, Beber and Revolusi. Besides, Wayang Museum also has some collections of wooden wayang like Catur, Cepak Cirebon, Kebumen, Pekalongan, Bandung, Gundala-Gundala from Tanah Karo, and Si Gale-Gale from Tanah Batak. There are collections of masks which were sourced from Cirebon, Bali, and Center Java. Other artifacts are also displayed in Wayang Museum, like gamelan, Blencong lamp, glass wayang, zinc wayang, and paintings. There’re some collections that sourced from abroad, some of them are from Kelantan, Malaysia, Suriname, France, Cambodia, and Thailand.